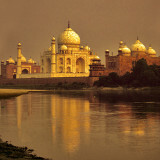 A World Heritage Site is a landmark which has been officially recognized by the United Nations, specifically by UNESCO. Sites are selected on the basis of having cultural, historical, scientific or some other form of significance, and they are legally protected by international treaties. UNESCO regards these sites as being important to the collective interests of humanity. More specifically, a World Heritage Site is an already classified landmark on the earth, which by way of being unique in some respect as a geographically and historically identifiable piece is of special cultural or physical significance (such as either due to hosting an ancient ruins or some historical structure, building, city, complex, desert, forest, island, lake, monument, or mountain) and symbolizes a remarkable footprint of extreme human endeavour often coupled with some act of indisputable accomplishment of humanity which then serves as a surviving evidence of its intellectual existence on the planet. As of July 2016, 1052 sites were listed. These are the few that I've visited, as of 2016, with more yet to load.